154th day of the year. There are then 211 days left in 2019.
on the 23rd week of 2019 (using US standard week number calculation). 76th day of Spring. There are 19 days left till Summer. 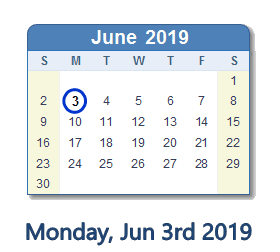 June 3, 2019 is the 29th and last day of Ramadan (Muslim Obsrvance). What happened on June 3rd 2019?